The club offers a good friendly atmosphere. We stock a wide selection of low-priced beers, wines, spirits and soft drinks. The club is run purely on a volunteer basis and is open Monday to Saturday evenings and on Sunday lunchtimes and evenings. 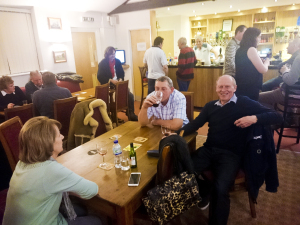 New members are always welcome - just pop into the club and ask for a membership form. There are facilities for playing darts, pool and crib and the club has its own darts, pool and crib teams. Entertainment will be hosted throughout the year such as Music Entertainment Nights, Race Night, Bingo Night, barbecues during the summer and Open Mic Nights. The club is situated in Sheards Lane, SN7 8LW. Telephone 01367 710734. Stanford Social Club in Sheards Lane was formerly known as The Working Men's Club. This was built in 1928 on donated land using voluntary labour, being run latterly by its steward, Fred ‘Buster’ Smith until his death in 1977, after which it was run by a group of 12 people as the Stanford Social Club.